Deepti Gupta, a Delhi born actress that was hailed by the New York Times is for her performance in the feature film ‘Walkaway’ as “film’s most affecting performance“ is the first actress of Indian origin to appear as a lead on Zindagi, India’s only premium Hindi channel, in their upcoming serial Ijaazat starting 20th January 2015. Ijaazat is a gripping tale of love and betrayal. It narrates the story of a married couple Seep – a writer and Sahil – a film director, whose love is tested when Seep writes the perfect female lead of her husband’s dreams. Deepti Gupta is a well-known name in the Pakistani television industry. 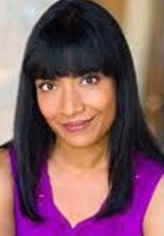 With an international career spread across India, Singapore, Pakistan and the United States, Deepti earned her MFA in Acting from University of Texas at Austin. As Seep, Deepti plays the role of a writer married to Sahil a film director. Seep is a deep soul with a lot of positivity. Seep’s life changes when she writes a script with a female protagonist that turns out to be her undoing. With Sahil’s attraction fading away Seep becomes an insecure woman who takes a lot of time to trust anyone.